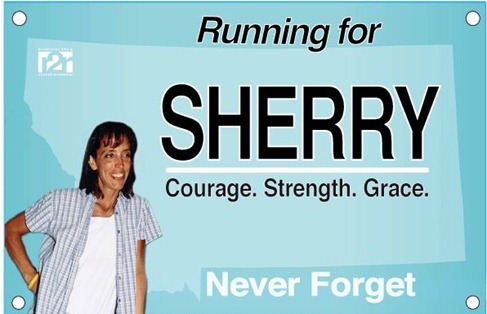 There were several different runs in Billings organized to run for Sherry, but I wanted to run this alone. I did a 10k for her. 10 minutes into the run I stopped and reflected for a minute about Sherry and all the lives this tragedy has affected. All of her family, friends and co-workers and runners everywhere like me that want to believe it is safe to go for a run near their house. When I set out it was sunny, but there was this line of clouds slowly working its way across the sky. 4.5 miles into my run they covered up the sun and since it was only 12 degrees outside, it was noticeably colder without the sun shining on me. It felt symbolic of the light that was taken out of her family's lives. One morning so much was changed forever. I liked to think that Sherry was looking down on all of us all around the state, the US and the world running for her. Running to celebrate her life, running to stamp out fear, and running to support her family. I got home and quick took a picture of the line of clouds but couldn't really do it justice as it went from one horizon all the way to the other. I'm new to running outside and her story was so sad and it should never have happened. What a beautiful way to remember her honor. that picture is gorgeous, definitely seems like symbolic. Great way to honor her! SO sad what happened to Sherry. And so scary. Absolutely beautiful. Sounds like a fabulous run. Good for you Christy. Run on! Beautiful picture. I really hope Sherry's family got some closure today. I know each day will be hard for them but I hope they felt the love around the world today. Gorgeous pictures and such an eloquent and perfect recap of a run for Sherry! That picture of the line of clouds is pretty. I also imagined Sherry looking down at us, doing this for her and her family. That cloud line is so pretty! I thought of Sherry so much today - I imagined her watching. Thanks for your recap. Everyone out running at the same time for Sherry is so inspirational! Beautiful, Christy! I know this must have been especially poignant for those of you in her home state. Love the pic. Totally fitting. A Click Review and ...Giveaway! Somedays its okay not to do anything. I ran in pee and it wasn't mine. The cake that fueled a fabulous 14 mile run. Poor new shoes and a Zuzanna sighting!